I mean, their experts right? They must know what's best. Plus, it feels safer to trust someone else.That is, until your own experiences prove what you believed was all wrong. Like black licorice or candy corn- just bags of lies and betrayal. At the beginning of my fundraising journey, I heard so many things that sounded like solid advice at first, but I found through my own experience to be incomplete, misleading, or downright false. The thing is, these lies didn’t start out that way at first. At one point in time they really were based on someone’s personal experience. Slowly we all believe them to be true, without taking any other experiences or circumstances into account. We all accept ideas as facts without stopping to consider why. This mentality can be harmful because it can keep people in fear of growing their event to the level of success that they could have. Or worse, makes people believe that because their stars didn’t align exactly like soandso’s, they’re bound to fail so why even try? Here are some of the biggest lies I’ve found that keep people from reaching their fundraising goals. See if any of these have shaped how you think about events and maybe kept you small. When I first started learning about fundraising events, I, like a lot of people, had the most trouble with figuring out how to get the word out. I needed to get sponsorships at some pretty high amounts and I had no idea how to do it. Okay, that sounds good, but what were the mechanics of making cold calls? Who should I put on my list? Is there a specific person I should be calling? What do I say to them once I’m on the phone? Maybe you’ve had some of these same questions. I discovered that when it comes to things that are out of our comfort zone (like making fundraising calls when you’ve never done it before) there’s definitely something to be said about adopting the Nike slogan of “Just do it” or “YOLO”. Whatever gets you moving. But it’s important to also take at least a little bit of time to figure out how to do things the right way. When I asked the people who told me to “just pick up the phone” to breakdown their strategy or process for me (because I’m a step by step, bullet point list kinda girl), I found that a good chunk of them actually couldn’t give me a straight answer. Because they didn’t really know what they were doing either. So don’t feel bad if you’re struggling to make fundraising asks. Sometimes it might feel like everyone else knows what they’re doing and that it’s easy for them, but trust me, that’s not true. Learning to effectively fundraise by planning an event is a skill that you learn like anything else. Everyone has their strengths and weaknesses. Figure out what your strengths are by focusing on the skills you’ve already developed and apply them to your fundraising efforts. When we’re just learning something, or aren’t at the point where we feel like we’ve mastered something enough, we tend to look around us to see what everyone else is doing. This is actually a great evolutionary skill for humans. We learn to survive and adapt from each other. Back in the caveman days, you see Bob eat a certain plant and the next day Bob is dead, well then you don’t eat what Bob ate. Cool. Now a days we have an amazing amount of knowledge and shared human experience at our fingertips at all times. It’s incredible how easy it is to learn pretty much anything you want to learn now with very few barriers to entry. With all the information out there, someone else’s lessons-learned can save us years of trial and error. But we also have to be careful with this. We tend to fall into the trap that if we see someone succeed, then there way must be the only way to succeed. I definitely got stuck in this mentality early on. I was so afraid of failing that I felt like I had to do an event that was the same as the others in my area. My event had to be a gala with a silent and live auction and a sit down dinner because that’s what everyone else was doing. The problem- you don’t stand out at all. People don’t get a chance to emotionally connect to you and your mission because what you’re giving them feels just like the last 4 events they went to. There’s nothing wrong with looking at people who have a similar tribe to you and seeing what they do that works. This is actually really smart. But be sure to look at more than just a few examples. Look at events that are happening in other cities. Or even different industries. See what you can learn from them and make it your own. On the flip side, it’s easy to get caught up in wanting your event to be revolutionary. You want to blow people’s minds so you do AllTheThings. This comes from a place of fear and thinking that our event won’t be good enough and people won’t want to come. I’ve found that this tends to happen most when people are either planning an event for the first time or putting together a planning committee for the first time. If you’re planning your first event it’s easy to get caught up in this because you don’t really know what your tribe will like in an event. You’ve never done it before. The first event is difficult because the whole thing is guessing. The real confidence in your event comes once you’ve done it, but there are ways that you can put yourself in a position to make better guesses. With folks putting together a new planning committee, you have a group of people who are excited about the project, which is awesome! They have a ton of ideas for what you all can do, and they’re fired up! You want to keep them all excited and happy so they stay engaged (instead of dodging your calls), so you have a hard time saying no to any of their ideas. This is a tough one. I’ve seen this so many times with my clients, especially if the planning or host committee is also helping to sell tickets or sponsorships to their personal networks. The thing is though, you have to say no to a lot of ideas in order to have a great event. For one, the pieces of your event have to be able to fit together so that your team can actually handle all of it on event day. Otherwise, it seems unorganized (or worse, confusing) to guests. They start to automatically wonder that if you can’t handle your own event, would you really be able to responsibly handle their donations? Yikes. I tell all my clients that they should pick no more than 2 to 3 things to focus on in their event and put their energy into doing them really well. Say no (or not yet) to everything else. It’s hard to say no to the ideas of your planning or host committee, but you have to think about the end game. At the end of the day, your committee wants to be a part of something that makes them look and feel good. If you decide to say yes to every single idea and your event is a mess, it won’t matter to them that you chose their idea. They’ll still be unhappy because they invested their time and attached their name to something that they aren’t proud of. On the flip side, if you do a few ideas really well and your event is a huge success, everyone is happy because your guests had fun and you proved that they were right to team up with you. So hear all of the ideas, stay creative. Focus on doing only a few things and knock them out of the park. Oh man. I could go on and on about this one. I’ve talked to so many people who want to have a fundraising event, but don’t have any money to budget for it. They’re hoping to get everything donated for free. That in itself isn’t a big deal, but becomes a massive problem when they also don’t already have the relationships required to get everything for free. Usually folks in this situation also aren’t giving themselves the amount of time they would need to build up those relationships. Fundraising events always require some sort of investment. Usually the resources required are money, time, and people power. Read more about it in this post. If you don’t already have a majority of the relationships you need to get things for free (I mean before you start planning your event), you’re going to need to spend time and/or money to make it happen. People aren’t going to give you things just because you feel like you deserve it. Sure, you do great work, but why should they care? Nonprofits aren’t entitled to other people’s money or getting free stuff just because they want it. This attitude is hustling backwards and will keep people from wanting to join your cause. Building relationships where you can have an event that costs little or no money comparative to their scale takes a long time because you have to invest in the people around you. You have to be able to build real relationships with people and show them all of the value you can give them and the rest of the community before you make asks. Another big lie that people believe is that you have to spend tens to hundreds of thousands of dollars to have a successful event. Sure, the average gala usually costs about that much, but who said you have to have one of those? A successful event is one that meets your goals. It’s an event that your ideal tribe want to go to, are willing to pay money for, and tell their friends about. With the right people, you can have a VIP mixer for 30 people at someone’s house that meets your fundraising goal. So many people tend to throw money at events because they think it’s what they have to do. Instead get to know your tribe and learn to build the perfect event for them. Figure out what your fundraising goal is and decide how you can creatively meet your tribe’s needs. Zeroing in on just your people can save you so much money (and time too) because you’re getting clear on putting your resources toward what they want, and only what they want. There you have it! Some of the biggest lies we all believe when it comes to planning successful fundraising events. See if you’ve fallen into any of these traps with your own fundraiser. The cool thing is that busting these myths feed into one another. Do some research about what’s worked for others, but don’t get stuck in copycat mode. Always be on the lookout for new things to try. Take the time to get to know your people. Find out what they’re interested in. This will help you narrow your focus so you can spend your resources only on the things that matter most. And from there, it’s all about taking your plans and building your event brand so that you’re known for doing a few things amazingly well. 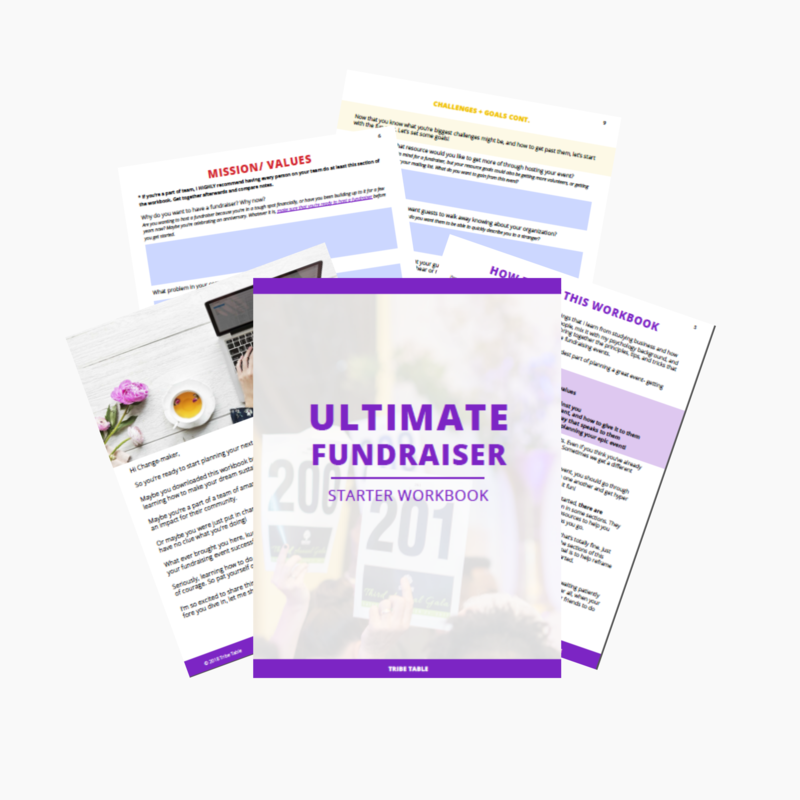 This will help you build a fundraiser that’s sustainable and hits your fundraising goal year after year. I hope you’ve found this helpful. I’d love to know, what are some of the biggest lies you’ve heard in your fundraising adventures? Leave a comment below.